Retail businesses are building mobile apps that do much more than just display products for sale. Mobile apps can shape the in-store experience, empower the purchasing process, and create interesting and dynamic ways to interact with the customer. Here is a list of mobile apps created by retailers. All of these apps are free. Customer service apps enhance the in-store experience. They ensure you have a productive and enjoyable store visit, and make sure you are not delayed or disappointed. Apple Store. The Apple Store app helps you get the most from your visits to the Apple Store. It does this by allowing you to make reservations for Genius Bar one-to-one assistance and sign-up for workshops and events. When in an Apple retail store, you can request help, check in for reservations, receive meet-up alerts, and get free iPad and iPod engraving and signature gift-wrapping for select Apple products. Also use the app to research, configure and purchase the latest Apple products. Available for iPhone. Redbox. This app enhances your experience with the Redbox DVD kiosks. The most intriguing way it does this is by allowing you to reserve a movie from your phone, so the DVD is waiting for you when you get to the kiosk. This is an excellent feature to enhance the Redbox experience. You can also search for movies available at Redbox or at a specific kiosk, and find the closest kiosk with the locator. Available for Android, iPhone. Starbucks Card Mobile. With Starbucks Card Mobile, you can display your Starbucks Card barcode and make purchases at Starbucks. View your transaction history, track your reward points, and locate a mobile payment Starbucks near you. In addition, Starbucks also has another app, myStarbucks, that has a drink builder, coffee and food menu, store locator, QR code scanner, and gives you access to Starbucks Digital Network for free music and news content on the web. Starbucks Card Mobile is available for Android, Blackberry, iPhone. myStarbucks is available for iPhone. Target. 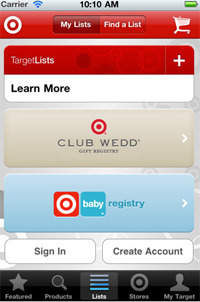 Target’s app helps you find the right products, making your shopping trip quick and easy. The best way it does this is with a My Lists feature. Make a list before you shop. Manage your lists and registries or find a friend’s. Search your store to get item availability and aisle location. Features also include a store locator, barcode scanner to get product details or add product to a list, and coupons for weekly and daily deals. Available for Android, iPhone. Westfield Malls. This app offers several features to enhance your shopping experience at one of the Westfield Mall shopping centers. Features an interactive mall map with every retailer’s website, map location and phone number. Save your parking location with a text or voice note. Create a shopping list. See what movies are playing and check show times. Offers additional mall information, such as mall-walker distances. Available for iPhone. Here are apps that make use of a smartphone’s ability to scan product codes and access product information, helping the customer find the right product. Best Buy. With the Best Buy app, scan QR codes in the store to access reviews and compare product specs. The app also allows you to create a technology wish list and find in-store availability. Track past purchases, reward points, and get special offers. Available for Android, iPhone. Home Depot. 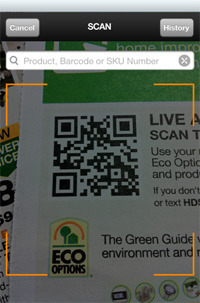 Scan a product’s QR or UPC code and obtain product information and user reviews. Share the item on Twitter, Facebook, email, or save it for later in My List. Check available inventory at your store, or nearby store. The app also features a store locator, in-store map of the store where you’re shopping, buy and send e-gift cards, feedback form, and access to hundreds of do-it-yourself project videos. Available for Android, iPhone. Toys “R” Us Shopping. Use the barcode scanner to instantly get product details, reviews and video reviews, particularly helpful for parents. Sort by relevance, price, ratings in search, and also browse. App also features a store locator. Enter your mobile number and receive special deals and alerts on your phone. Available for iPhone. ATM Hunter. This app by MasterCard Worldwide uses GPS to find your closest ATM. Also it offers financial tips. Available for Android, iPhone. These apps turn a passive catalog into an interactive experience. Gap StyleMixer. With the Gap StyleMixer, you can build your outfits in MyStyle. Explore trends in Lookbook and check out videos from trendsetters. Make shopping lists, check out stylish looks from the StyleMixer community, as well as receive exclusive offers. Available for Android, iPhone. Hollister. 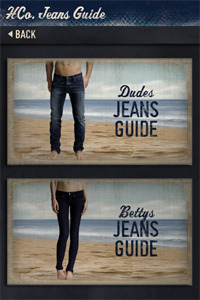 This app contains a jeans guide, which displays the right fit for each style of jeans. Swipe the jeans image to flip between front and back view. Available for iPhone. Here are some additional branded apps to help you perform product-related tasks, or just enjoy the products. Teavana Perfect Tea Touch. 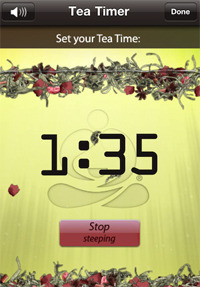 This app features a timer to steep different types of tea, playing unique music and visuals while you wait. The app has tea blending suggestions and preparation instructions. While this app helps you prepare any brand of tea, there is a store locator to get you to Teavana. Available for iPhone. Teavana Perfect Tea Touch screenshot. Buy Back. This is a novelty app by Best Buy. Transform your mobile phone into a telephone time machine, from a vintage rotary phone to a future phone that requires your fingerprint. App also features Buybaculator, which calculates your Buy Back gift card amount from electronic trade-ins, and an upgrade checker to let you know when you should upgrade your phone. Available for iPhone. Excuse Clock. This is another novelty app by Best Buy. 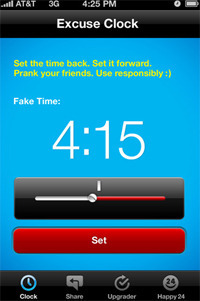 It lets you set a display time to prank your peers. Available for iPhone. Sometimes it is about the deals. Here is a retail store app for coupons and deals. JC Penney Weekly Deals. 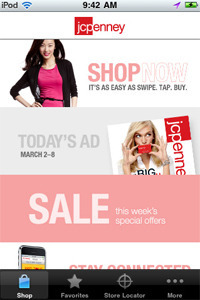 This app gives you weekly deals and special offers at JC Penney. It offers mobile coupons, access to your reward points, and has a store locator. Available for Android, iPhone. JC Penney Weekly Deals screenshot. Mobile Commerce: Better to Create an App or a Mobile-optimized Site?